NEW YORK, NY (Jan 25, 2011) – The consensus 2010 Fighter of the Year, Sergio “Maravilla” Martinez is gearing up for another banner campaign in 2011. It all starts on March 12 when Martinez, the recognized champion at middleweight squares off with reigning World Boxing Organization (“WBO”) junior middleweight champion, Sergiy “Razor” Dzinziruk at the MGM Grand Arena at Foxwoods in Mashantucket, Connecticut. The winner will walk away with the prestigious World Boxing Council (“WBC”) Diamond Championship at middleweight. In the co-feature attraction, two of Western Europe’s best, and most exciting pugilists, Andy Lee of Ireland and Scotland’s Craig McEwan do battle in a ten round “Celtic War” in the middleweight division. “Diamond Elite: Martinez vs. Dzinziruk” will be presented by DiBella Entertainment in association with Gary Shaw Productions and Banner Promotions. Lee vs. McEwan will be presented by DiBella Entertainment in association with Golden Boy Promotions. Both bouts will be broadcast live on HBO’s World Championship Boxing beginning at 10:30pm ET / 7:30pm PT. Tickets for “Diamond Elite: Martinez vs. Dzinziruk,” are priced at $450, $250, $125, $75, and $50 and will go on sale Wednesday, January 26, at 10:00am ET through the MGM Grand at Foxwoods box office. Tickets can be purchased online at www.mgmatfoxwood.com, by calling the MGM Grand at Foxwoods at 1-866-646-0609, or in person at the MGM Grand at Foxwoods box office. “March 12 is what world class boxing is all about,” said Lou DiBella, President of DiBella Entertainment. “Sergio Martinez is proving that he has no interest in resting on his laurels by taking on an accomplished champion such as Sergiy Dzinziruk. 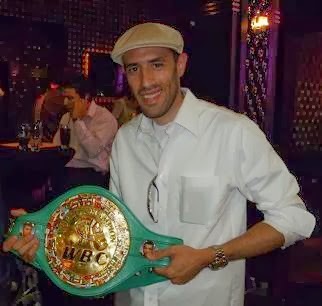 Once again, ‘Maravilla’ will show why he is not only the 2010 FIghter of the Year, but also the people's champion. Martinez (46-2-2, 25 KOs), 35, is coming off the biggest year of his professional life. Last April, he won the middleweight championship, in just his second bout at the weight class, with a dominating 12-round victory over Kelly Pavlik at Boardwalk Hall in Atlantic City. Seven months later on November 20, Martinez, a native of Argentina by way of Oxnard, California, returned to Boardwalk Hall to face Paul Williams in a rematch of his razor thin majority decision loss to Paul Williams, which was widely heralded as one of the best fights of 2009. If their first showdown was Fight of the Year, Martinez left no doubt in 2010 in what was certainly the Knockout of the Year. Just a minute into the second round, Martinez landed a booming overhand left that knocked Williams out cold and sent shockwaves throughout the sports world. To cap off 2010, Martinez was lauded by nearly ever publication and organization – including ESPN, the Boxing Writers Association of America, Yahoo Sports, Sports Illustrated, MaxBoxing.com, BoxingScene.com, AOL Fanhouse, The Cleveland Plain Dealer, El Paso Times, San Antonio Express-News, Secondsout.com, and The Ring Magazine – as Fighter of the Year. Dzinziruk (37-0, 34 KOs), 34, has held the WBO 154 lb. title since 2005 when he decisioned Daniel Santos in his adopted home of Germany. Since then, the native of Ukraine has defended his title successfully six times, including his last bout which served as both his American debut and debut under the joint promotional banner of Gary Shaw Productions and Banner Promotions. In that bout, on May 14, 2010, in Santa Ynez, California, Dzinziruk systematically broke down Daniel Dawson en route to a tenth round stoppage. Lee (24-1, 18 KOs), 26, is riding a nine fight winning streak since his lone career setback: a loss to Bryan Vera in 2008. Since then, the Emmanuel Steward-trained Irish slugger has compiled some of the best wins of his career over the likes of experienced veterans James Cook, Willie Gibbs, Michael Walker, and former world title challenger Mamadou Thiam. Lee is ranked #5 by the WBA and #14 by the WBC. McEwan (19-0, 10 KOs), 28, was born and raised in Edinburgh, Scotland, but now lives in California where he trains with the world renowned Freddie Roach. McEwan is coming off the biggest win of his career on July 23, 2010, when he took a decision from former world title challenger Danny Perez. McEwan also holds a victory over Bryan Vera, the man who handed Lee his lone defeat. McEwan is ranked #12 by the WBO.